At Val de la Marquise we offer a range of lovely wooden chalets, for a cozy stay in a natural environment. Our camp ground is immersed in the beauty of the surrounding natural environment. We constantly live outdoor. You only have to open your door and take a deep breath of fresh air to fully enjoy staying on the doorstep of the beautiful forest of Campagne. 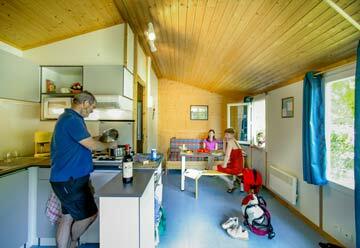 At our camp ground we offer three types of chalets. Imagine yourself on the terrace of a family cottage, planning your visits to the most beautiful castles of Dordogne (Puymartin, Beynac, Milandes, Puyguilhem, Losse, Monbazillac, Montfort …) and prehistoric caves (Lascaux, Rouffignac). Want to convert your dream into reality? 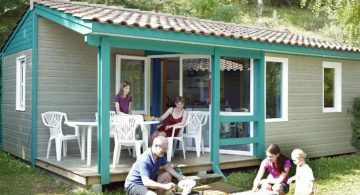 Rent a beautiful wooden chalet at Camping Val de la Marquise in Campagne near Sarlat! This ecological fully equipped housing located in a vast wooded area is a delight for children and adults looking for luxury and excellence. Chalet Lavande of 21 m2 for 4 to 5 people, chalet Bruyère of 26 m2 for 5 to 6 people, Chalet Détente with television of 28 m2 for 5 to 6 people: our selection of prestigious chalets includes three models adapted to all the profiles of vacationers: couples, families, groups of friends … Living room with kitchen, separate bedrooms, bathroom, WC, private covered terrace, heating: discover in detail our fabulous chalets! 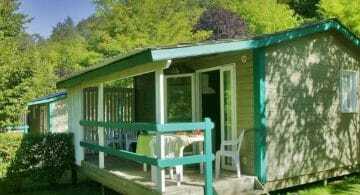 You have chosen to spend your holidays in the Dordogne camping because you want to stay in a green and authentic, always stay in touch with nature, let your children run freely or cycle through the flowery paths and trees of your hotel full air. Do you want to see them at work and immortalize their adventures? Make yourself comfortable on the private terrace of your chalet in the Val de la Marquise, and wait for their next visit. You will also enjoy your terrace with its garden furniture at mealtimes, naps, your reading moment, your card game with family or friends or your star observation couple. All terraces of our chalets are covered, which will allow you to stay outside even in rainy weather. Is not it good, under the Aquitaine sun or the freshness of summer evenings? Stop assuming and come live this unique experience in the Périgord Noir!